A dawn karakia (blessing) performed by Tohunga Koro Tutua and supported by a contingent of hahi Ringatu kaikarakia marked the completion of the first stage of the Toi Moana Bay of Plenty Regional Council’s office upgrade project last week. Koro Tutua (Tohunga) was supported in the karakia by a group of kaumatua, including Teku Ngatai, Wiremu Reneti, Rex Anderson, Sonny Rua, Joe Te Maipi and Tamehana Te Rire. 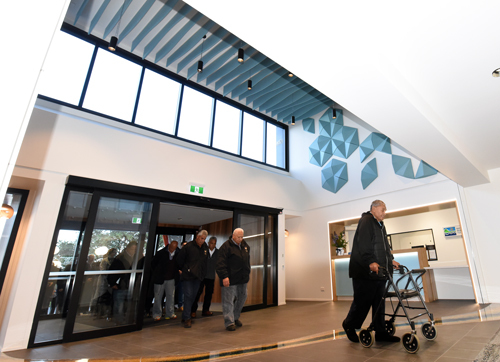 The Regional Council’s refreshed foyer, council chambers and eastern office space were officially opened to the public and staff following the karakia. The calibre of Iwi involved in the karakia was greatly appreciated by councillors and staff. The Toi Moana Bay of Plenty Regional Council is currently in the middle of a major upgrade of the 24 year old building, which when completed, will see it become one of the most environmentally sustainable buildings in town. Chairman Leeder said he was pleased to be able to attend last week’s karakia, acknowledging the support of Iwi and congratulating staff on what had been achieved. “Although it was at the leading-edge of what was available in regards to sustainable design features back in 1994, by 2018 the building was clearly lagging behind and required some major work,” Mr Leeder said. “This work has enabled us to take a look at how we work as a council, and incorporate some of those values into the design, such as moving staff from individual offices to a more collaborative open plan environment. Sustainable practices throughout the construction phase have also been a strong focus. For the first stage of the building upgrade 82m3 of concrete, 800kg of copper piping, 460kg of wire and 1.9 tonne of oversized steel has been recycled. All doors and six trailer loads of timber have also been reused locally. Cultural adviser William Stewart is assisting with the incorporation of cultural features including the ‘mountains to sea’ concept which encapsulates the unique natural features unique to the Bay of Plenty. The karakia was followed by the first full council meeting in the building since work began in January. Work continues on the refurbishment of Regional House in Tauranga. Work was budgeted for in the Long Term Plan 2018-2028.